A whitening daytime moisturiser that drenches skin in refreshing moisture while protecting against harmful UVA and UVB rays. Spawake Whitening Ultra Fresh Gel Cream is a feather-light, fast absorbing formula that wraps skin in pure comfort, infusing it with Vitamin C and Vitamin B3 to reduce dark melanin production and algae extract to protect from sun damage. Your skin appears clear, luminous and feels comfortable throughout the day. Explore the entire range of moisturizer available on Nykaa. Shop more Spawake products here.Alternatively, you can also find many more products from the Spawake Whitening Ultra Fresh Gel Cream range. Explore the entire range of Face Moisturizer & Day Cream available on Nykaa. 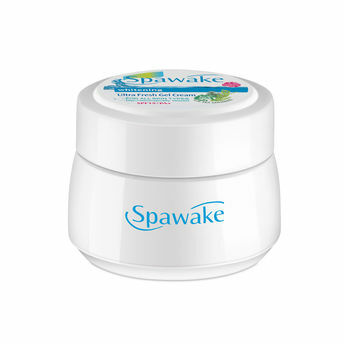 Shop more Spawake products here.You can browse through the complete world of Spawake Face Moisturizer & Day Cream .Alternatively, you can also find many more products from the Spawake Whitening Ultra Fresh Gel Cream range.